BOSTON--(BUSINESS WIRE)--Debt levels are reaching record highs in the country—but is this having an emotional toll on American households? According to Fidelity Investments®’ latest Couples & Money study, more than half of the couples surveyed carried debt into their relationship—and for those that did, four in ten admitted it had a negative impact. Whether couples bring debt into their marriage is not really the issue, however, it’s how they handle it. 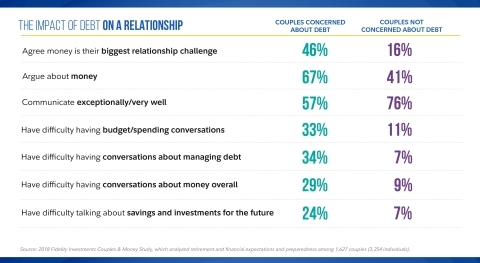 Unfortunately, for those who say they are concerned about debt today, nearly half also admit that money is their biggest relationship challenge. Fidelity’s mission is to inspire better futures and deliver better outcomes for the customers and businesses we serve. With assets under administration of $7.0 trillion, including managed assets of $2.5 trillion as of May 31, 2018, we focus on meeting the unique needs of a diverse set of customers: helping more than 27 million people invest their own life savings, 23,000 businesses manage employee benefit programs, as well as providing more than 12,500 financial advisory firms with investment and technology solutions to invest their own clients’ money. Privately held for 70 years, Fidelity employs more than 40,000 associates who are focused on the long-term success of our customers. For more information about Fidelity Investments, visit www.fidelity.com/about. Fidelity announces the findings from its 2018 Couples and Money study.